For customers who enjoy washing their own vehicles, motorcyclists, those with trailers, or the few vehicles that may not fit through our automatic car washes, we welcome you into our self service bays. They’re stocked with high-pressure wash hoses. New Outdoor Wash/ Perfect for Boats, RVs, Trailers, Trucks and more! For customers seeking a meticulously deep carpet cleaning, Top Cat Car Wash’s vacuum island is home to four dirt-hungry vacuums. Drive in dirty; pull forward clean! 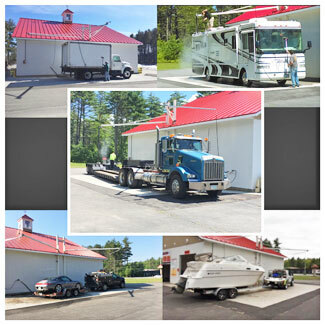 Top Cat Car Wash’s Auto Bath is a family-owned automatic and self service car wash centrally-located at 760 New Hampshire 16, Ossipee, NH.